Peoria Assn. Of Pastors For Community & Spiritual Renewal: Don't Be A Zero, Be A Community Hero! 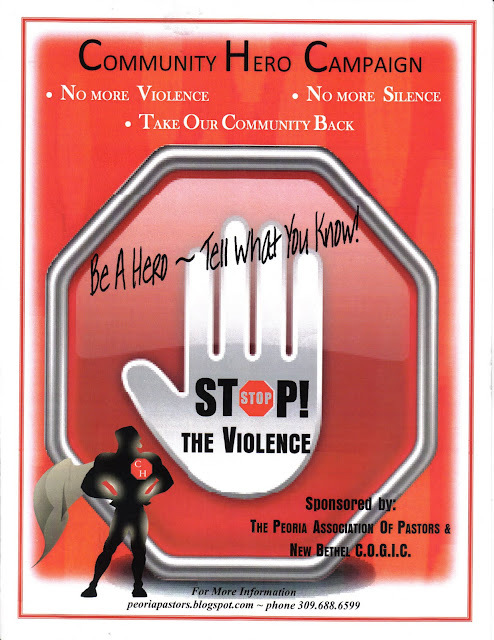 The Peoria Association Of Pastors For Community & Spiritual Renewal are reaching out with a Community Hero Campaign designed to combat and directly effect the challenges associated with the "street rule" of "no-Snitchin'". "Be A Hero. Tell What You Know!" 1- I Am My Brother's Keeper. When someone in my group is not coming up to the standards of behavior, I am not afraid to check him and remind him that we are holding them/him or her accountable for their actions. 2- Crime Doesn't Get The Silent Treatment. Criminals have no heaven or respite in my environment and as a group we are not afraid. Multiple eyes are taking it all in with an intent to deliver information to the proper authorities at the proper time in order to help the community be a safer one. Each one is rewarded according to their open participation in assisting and serving their community. 3- Pastors, Churches, Community Organizations & Civil Organizations Will Support & Facilitate Community Heroes Efforts. Citizens standing to take their community back need support. We will commit to not leave neighborhoods, and individuals without support as they endeavor to stand and take their community bringing it back from the grip of crime and violence. The Police department has heard the voice of the community. Their commitment to the safety and privacy of those submitting information has never been more strong. Like us, they want to save lives and help improve the quality of life for all of Peoria's citizens. I heard a conversation between a first grader and a fellow friend. The child was angry because his friend had told the teacher about his actions and how he had been hurt as a result. the offending child immediately responded by saying, "You're nothing but a tattle-tale, you little snitch!" The child who had been offended felt bad because now he had been given a label all because he was trying to keep from getting hurt further. in other words the message was that his pain was acceptable reality for someone's gain. From a very early age, unwritten rules and codes of conduct are established and many of these rules only serve the most dominant and the most threatening or domineering personalities. Like the boy who was offended and let down emotionally, some feel out of place to speak up for themselves and for their community. The problem is even more pronounced because of efforts such as those by gansta-rappers and gang-members like Rodney Bethea who promoted the "Stop Snitchin" message through videos and using all star personalities like Denver Nuggets NBA All Star Carmelo Anthony. It was an effective approach and got the attention of the youth and the gang culture by the droves. At that time the purpose of the message was to reinforce the idea that the Police and authority weren't the friends of the community and that there would be strong retribution for those who "talk too much" pointing out drug dealers, gang leaders and other trouble makers. Because of this type of message and a long history of community/police mistrust, the streets have almost clammed up tight with people who witness crime saying absolutely nothing in response to it. The who thing has set a fear in the hearts and minds of many individuals and communities as a whole. Thus the problem is displayed, criminals seem to think that they will be able to get away with their actions because there community will remain silent about their activities. There is a Community Rally against crime and violence scheduled for June 27th 2010. "Don't Be A Zero, Be A Community Hero" is the theme. It will be held at the Neighborhood House in the parking lot area from 2-4:00 PM. Please plan to attend. Your participation is essential in sending the message that this is our community and we want it back. I personally ask each of you to promote the Community Hero message to our youth and fellow citizens wherever they may be. We ask business owners to allow these flyer's to be visible in their places of business. We ask parents and community leaders to share and promote the message that speaking up is a good thing for the community and being silent is not being heroic. We would like everyone to promote the message that this is our community and we will not continue to surrender it to gangs, drugs, crime and violence. You can ask your church and your pastor to be a part of this association, these community efforts and to unite to address issues of community need. Media can help promote and spread the Community Hero Campaign through PSA's and other forms of assisted advertising, and contributions can be given so that we can expand our efforts and flood the community with positive words, expressions and activities that we know change and save lives. Also you may email me at Dunamis1@netzero.com or visit our Facebook Page for updates and announcements on community activities.This is the start of addressing crime and violence at the heart and center of the community's moral base, distilling stigmas against being a part of the solution. We will be a part of the solution and not the problem. Thank you. Pictures from the DMI rally can be found HERE at the Peoria Journal Star's web site. It was a great event and we were blessed. Hopefully the beginning of much greater things. The community unity was fantastic and the band and Teen Challenge were great. 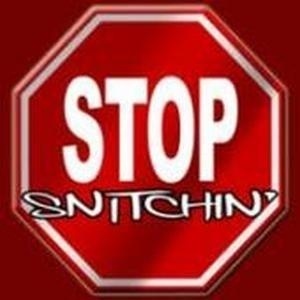 Emerge, has an interesting followup on the fate of the "stop snitchin" promoters. That silliness must be dealt with and we are in position to do it. Please, let's take this message of "Stop The violence" to a new level. Shirts and special promotions are on the way!